It's hard to imagine how the 2008 championship fight could possibly have come to a more exciting conclusion. The sight of both the Ferrari and McLaren teams celebrating wildly in the Interlagos pitlane, before the former squad realised its jubilation was premature, was proof of that. The main reason it took until the final corner of the very last lap of the year for Lewis Hamilton to seal the championship was because this season provided so much inconsistency amongst the frontrunners. It was hard to reconcile the Hamilton who was in a league of his own in the wet in Monaco and Britain, who turned a seemingly impossible situation into a Hockenheim victory, and who dealt with the pressure of Shanghai so superbly, with the same man that crashed in the Montreal pitlane and threw away the Japanese GP within yards of the start. Similarly, Massa looked out of control in Australia, Malaysia and Britain, yet could not have been more composed amid the intensity of Interlagos. Despite these fluctuations and lapses, both contenders did enough to prove themselves worthy winners of a title fight that contained little of last year's rancour. The Spa penalty controversy and Fuji tangles led to a few differences of opinion, but nothing like the acrimony that characterised 2007. It wasn't just the ultra-tight points race that made this such a remarkably close year. At most races there was virtually nothing to choose between Ferrari and McLaren, and rarely has a Formula 1 grid boasted so many drivers on peak form. As well as Hamilton and Massa, Robert Kubica achieved miracles while seething at BMW's inability to stay in the title fight, Fernando Alonso regained his mental equilibrium at Renault and was back to his majestic best, and Sebastian Vettel proved his potential in epic style at Monza. Kimi Raikkonen only occasionally seemed able to access his still-awesome talent, but remains a match for anyone else on the grid when on form and, while Heikki Kovalainen's season fell apart after Silverstone, he had previously given Hamilton plenty to think about. It wasn't just the drivers who were evenly-matched. There was often only two seconds covering the entire field, and every team bar Force India and Super Aguri managed to get a driver on the podium. There are fears that next year's radical rule changes will scatter the pack again and lead to a runaway champion. But if 2008 does prove to be the end of an era, then there could not have been a better way for this chapter of F1's history to conclude. Melbourne lived up to its reputation for carnage with a scruffy first round featuring two safety car periods and only six cars actually running at the chequered flag. Hamilton let it all unfold in his wake - taking pole position and leading from the front to get his title bid off to a very strong start. By contrast, reigning champions Ferrari had a disaster. Raikkonen had to begin his title defence from 16th on the grid thanks to a qualifying fuel-pump failure. Although he carved through the field in the race, two trips off the road and then a late engine failure left him classified only eighth. Team-mate Massa spun at the start, tangled with David Coulthard while recovering, and then also suffered engine failure. With Ferrari in disarray, it was left to BMW to take the fight to McLaren, with the resurgent Kubica splitting Hamilton and Kovalainen in qualifying. But he lost ground in the race and was later taken out by Kazuki Nakajima during a safety-car period. BMW still had a car on the podium, though, as Nick Heidfeld beat the impressive Nico Rosberg (Williams) to second place. 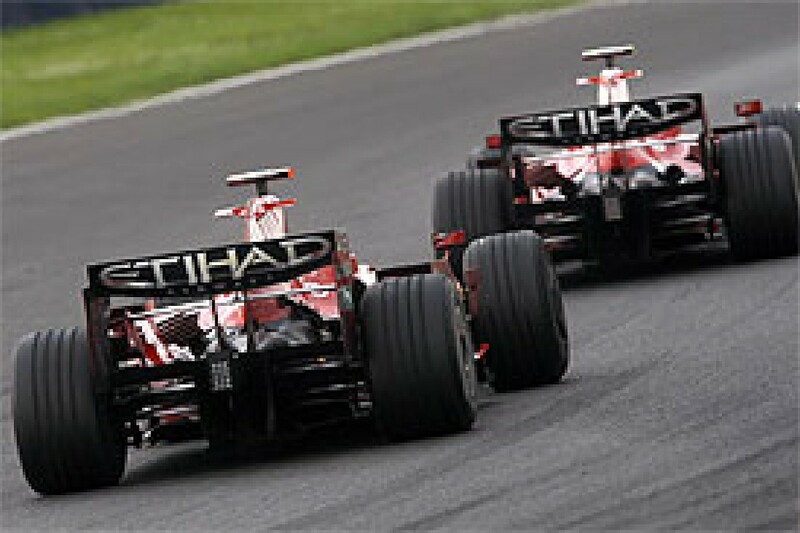 Both had benefited from Kovalainen losing places when forced to pit during a safety-car period. 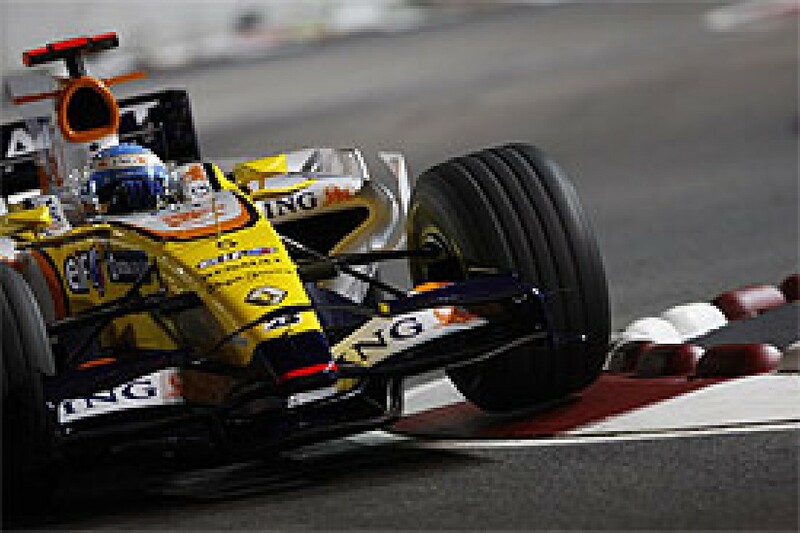 The Finn eventually fought back to fifth after a superb late battle with Alonso and Raikkonen. The former champion delighted Renault with his charge to fourth place, despite only qualifying 11th. It didn't take Ferrari long to recover from the Melbourne embarrassment, and Sepang should have seen a flawless one-two for the Italian squad had Massa not thrown second place away. The Brazilian had taken an outstanding pole (half a second clear of Raikkonen despite being heavier on fuel), but was jumped at the first stops thanks to his teammate's excellent in and out-laps. Massa dropped his Ferrari in the gravel soon after. 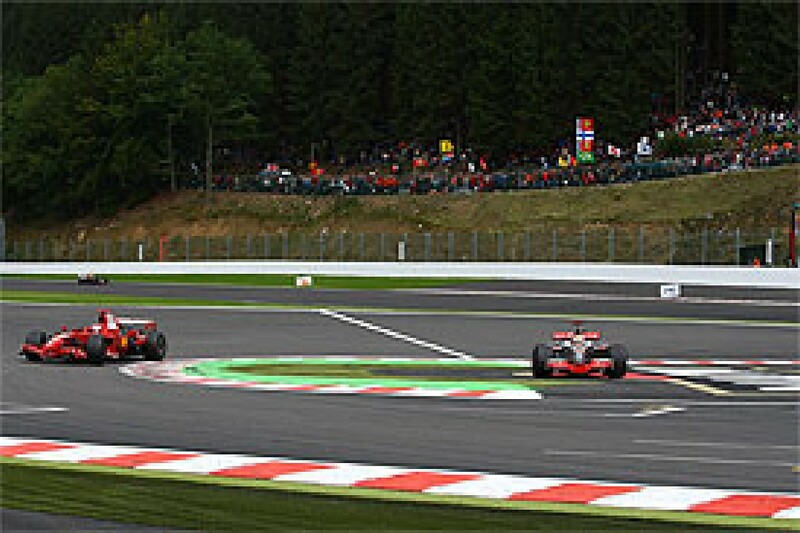 Raikkonen was then left to dominate the rest of the race, taking a comfortable victory over Kubica, as this time it was McLaren whose weekend went awry. Kovalainen and Hamilton were third and fourth fastest in qualifying, but set their Q3 times early due to the threat of rain. They then backed off, forcing those still pushing to dodge around the dawdling McLaren pair, who both received five-place grid penalties. Hamilton made the best progress initially, but was further delayed by a wheelnut problem at a pitstop. While Kovalainen came through to third place, his British teammate had to settle for a frustrated fifth, behind the impressive Jarno Trulli. 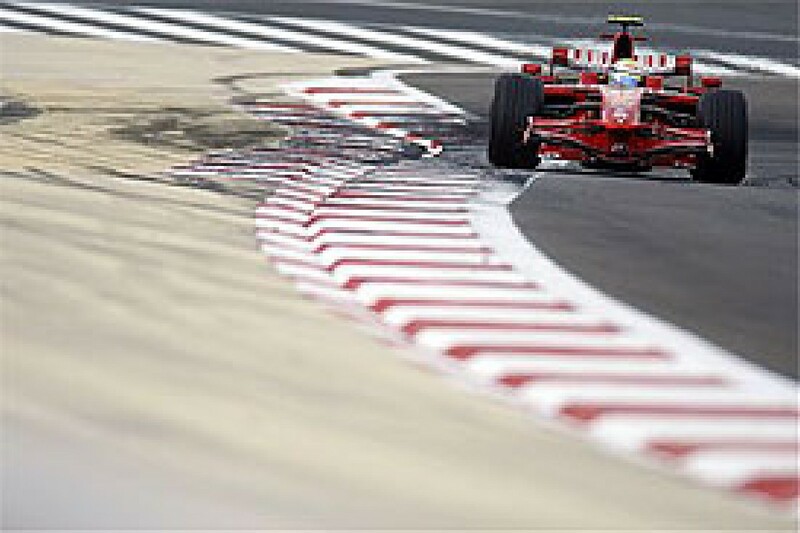 Just like last year, Massa arrived in Bahrain under heavy pressure following an abysmal start to the season - and, in another repeat of 2007, the Ferrari driver responded by dominating Sakhir. Fastest for most of practice, and only denied first on the grid by the slightly lighter Kubica - who claimed his and BMW's first pole - Massa jumped ahead at the start and was untouchable for the rest of the afternoon. Raikkonen qualified an unhappy fourth but fared better in the race. After passing Kubica when the BMW driver was caught out by spilt oil early on, the Finn was able to keep Massa on his toes while fending off the determined Kubica for second. McLaren's season seemed to be going off the rails. Hamilton made a very bad start from third, then ran into the back of Alonso on lap two. The resultant stop for a new front wing left him 13th at the flag, while Kovalainen was pushed back to fifth by Heidfeld and was nowhere near Ferrari's and BMW's pace. As Raikkonen absolutely dominated the Spanish GP and established a nine-point lead in the championship, no-one would have believed that this would be his final victory of the season. The Finn was at his best in Barcelona, denying home hero Alonso a shock pole position and then controlling the race throughout, with Massa taking second at the start and then calmly completing a Ferrari one-two. Hamilton came through from fifth on the grid to a quiet third on a traumatic day for McLaren. Kovalainen had moved into the lead during his long first stint, only for a wheel failure to pitch him into a ferocious impact with the tyre wall at Campsa. He emerged thankfully unscathed after a precautionary trip to hospital. Kubica had to settle for fourth this time, albeit still right on McLaren's pace, while Alonso would have been fifth but for an engine failure. He had run third early on (despite a half-spin on the parade lap!) before dropping back at the first stops. Mark Webber's fifth place was one of Red Bull's most competitive performances of the year, as was Jenson Button's sixth for Honda, which would turn out to be his sole 2008 points finish. The Briton benefited from an engine failure for Rosberg, from Heidfeld having to stop in a closed pitlane during the yellow for Kovalainen's crash, and from Trulli being erroneously called into the pits when it was in fact his Toyota teammate Timo Glock who needed a new front wing! 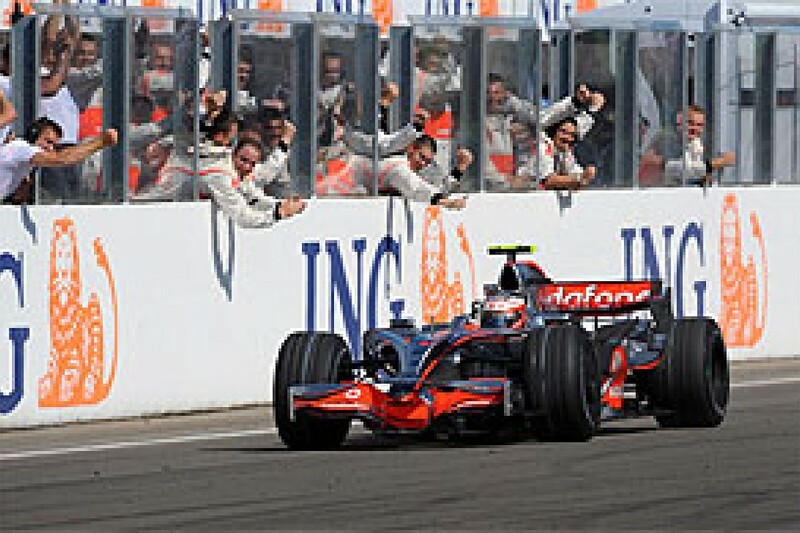 For the third year in a row, Massa took pole and victory at Istanbul Park, although the improving McLarens made him work hard for this one. Kovalainen returned in fine style after his Catalunya accident and almost grabbed his first pole. Unfortunately he then tumbled to last after being clipped by Raikkonen following a bad start, leaving the McLaren with a puncture. He fought back valiantly but only reached 12th. That left Hamilton to take the fight to Massa, but he was hamstrung by tyre-wear worries, so ran a three-stop strategy - which meant he had to try and build a gap to the Ferraris. Hamilton passed Massa with a brave move into the final corners and then pulled away, but couldn't stretch enough of a margin to cover his additional stop. 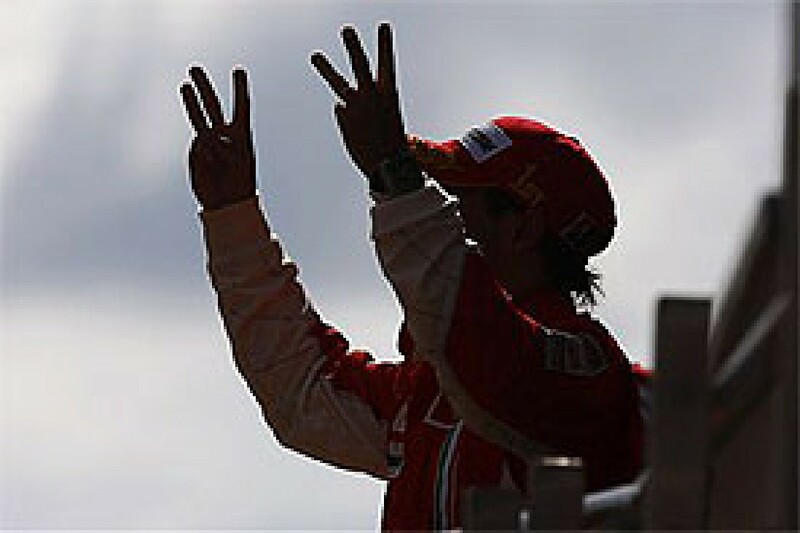 He did, however, manage to beat the out-of-sorts Raikkonen to second place. BMW appeared to be losing ground as Kubica and Heidfeld took low-key fourth and fifth places, ahead of Alonso. On a track he disliked, where he had never impressed, and in a team that had been miles off McLaren's street pace in 2007, Massa was left chuckling in disbelief after taking Monte Carlo pole position ahead of Ferrari teammate Raikkonen. That surprise was followed by an epic race, as Monaco hosted its first wet GP in more than a decade. Massa pulled away at first, with Hamilton seeming to ruin his chances when he hit the Tabac barrier early on. Remarkably, he escaped with just a puncture, and only lost a handful of places because the leaders had already pulled so far ahead. Better still, his stop for repairs actually put him on the perfect strategy for the eventual change in weather conditions. Massa then found himself under pressure from Kubica, and lost the lead when he went up the Sainte Devote escape road briefly. Having filled up with fuel at his puncture-repair stop, Hamilton enjoyed a long spell in the lead as the others pitted on their normal schedule, and his remarkable times during this period allowed him to vault back to the front. He was helped by the fact that the track dried just in time for what could now be his final stop, whereas his rivals had to pit again for slicks. That sealed an amazing win for the Briton, while Kubica's better-timed tyre change helped him beat Massa to second after they had earlier swapped positions at the first stops. Webber and Vettel (from the back row of the grid) emerged in fourth and fifth thanks to excellent wet-weather drives and some carnage among the frontrunners. Both Kovalainen and Raikkonen had their races ruined before the start - McLaren's Finn was left on the grid thanks to an electrical problem that forced him to start last; and Ferrari's was given a penalty after a wheelnut gremlin meant his mechanics stayed on the grid too late while fitting his tyres. The Ferrari driver later removed one front wing on the Sainte Devote barriers, and another on the rear of the superb Adrian Sutil's Force India, leaving the young German out of the race and heartbroken after he had brilliantly climbed to fourth place. A year after his horrific crash at Montreal, Kubica returned to Canada and took his and BMW's first GP win with a brilliant performance in a typically crazy race. Kubica had pushed Hamilton hard for pole and then followed the McLaren in the opening stint, before a yellow to retrieve a stranded car persuaded the leaders to make slightly early first stops. A great Ferrari service meant Raikkonen leapt from third to first, only for the inattentive Hamilton to plough into the back of him at the pit exit, where Raikkonen had been obediently waiting at a red light while the safety-car queue passed. Rosberg then repeated Hamilton's error and struck the McLaren. With Hamilton and Raikkonen out, Kubica was handed a golden opportunity to win - but first he had to get through those who hadn't yet stopped, and pull out enough of an advantage over the one-stoppers to negate the time lost from his second pit visit. Some outstanding times on low fuel allowed him to do just that, while teammate Heidfeld converted to a one-stop plan after the yellow and duly completed a BMW one-two. Alonso should have been on the podium had he not crashed while pressuring Heidfeld, so instead third place went to David Coulthard, whose one-stop strategy allowed him to leap up the order following the safety car. Massa and Kovalainen were both off the pace in qualifying, coping worse than others with a track surface that was crumbling in many places. While the Brazilian managed to salvage fifth - between the Toyotas - from the race, despite a fuel-rig problem forcing an extra stop, Kovalainen never regained the ground lost waiting behind Hamilton in the pits and could not separate pitlane starter Vettel from the final point. With Hamilton given a ten-place grid penalty for his Montreal gaffe, Kovalainen demoted five places on the grid for inadvertent blocking in qualifying, and BMW off the pace, Magny-Cours presented an open goal for Ferrari, which invariably thrives at this track anyway. It should have been Raikkonen who benefited but, after controlling the first half of the race, he was forced to slow when part of his exhaust worked loose and began flailing around dramatically. 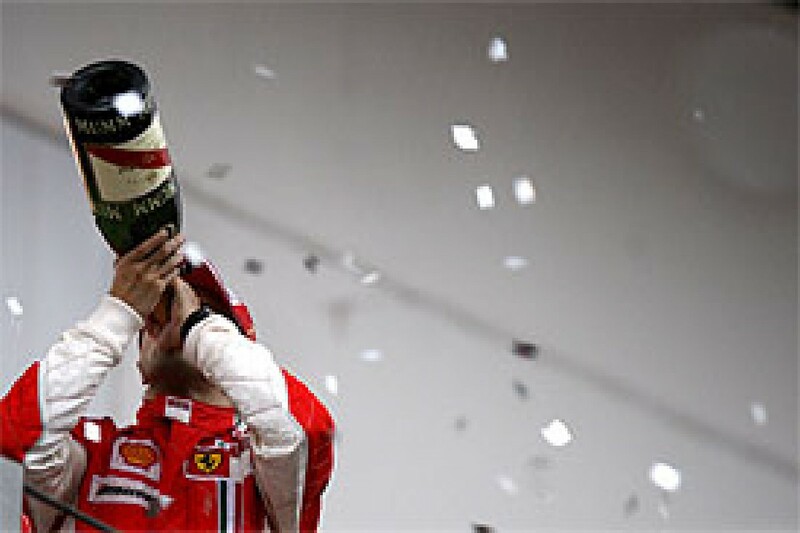 That handed the lead to Massa, who duly won and moved to the head of the championship, while Raikkonen limped home second. 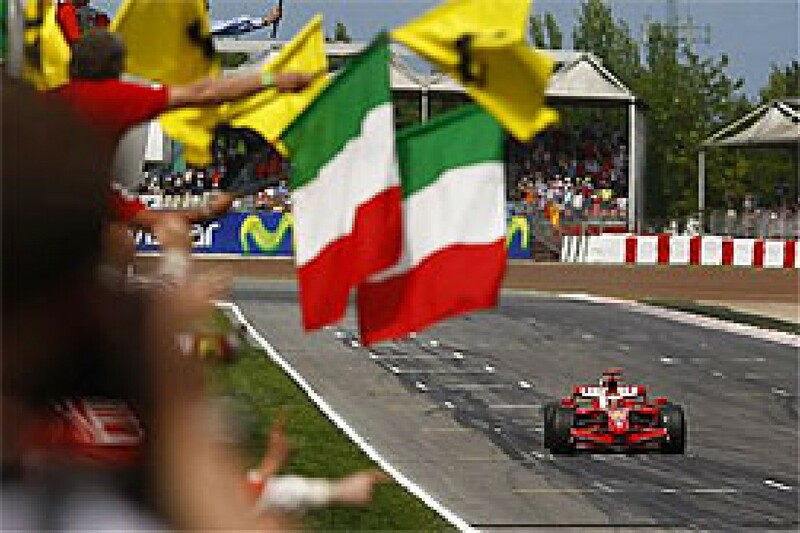 Trulli drove a superb race to fend off the recovering Kovalainen and Kubica for the last podium spot, as Hamilton was hit with a second penalty for cutting the Nurburgring chicane when fighting with Vettel on the first lap, leaving him 10th at the flag. Alonso was also frustrated after the French GP, having qualified third only to lose ground with a slow start, a first pitstop that dropped him straight into the worst of the traffic, and then a penultimate-lap error that allowed Renault teammate Nelson Piquet to demote him to a miserable eighth. Kovalainen took a sublime maiden pole in gusty conditions on Saturday, while teammate Hamilton struggled to fourth on home ground, but the tables turned spectacularly when the rain arrived on race day. Hamilton wasted no time in surging to the front and pulling away as the weather fluctuated between bad and appalling all afternoon. Often several seconds faster than the rest of the field, he lapped all bar the podium finishers and could have won by whatever margin he pleased. His fellow title contenders floundered. The Ferrari was particularly tricky to drive in the wet, and Massa - who was off the pace in qualifying - had a humiliating five spins on the way to 13th and last, two laps down. Raikkonen fared better until staying with worn intermediates at his first pitstop, just before the rain returned with a vengeance and rendered these tyres useless. A series of spins and some very slow times followed, but he eventually recovered to fifth, behind Kovalainen, who had a few excursions of his own and struggled with severe understeer on his wet setup. 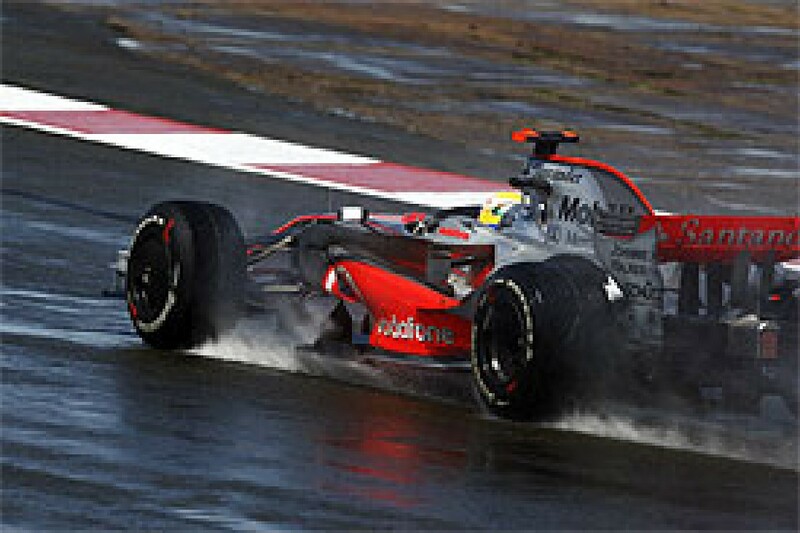 Kubica made his only major error of the year by aquaplaning out of the race, while Alonso fought for the podium until he too retained worn inters at the wrong moment. Renault put things right as soon as possible, but a long stint on heavy fuel would leave Alonso a sitting duck at the end of the race, causing him to fall from fourth to sixth. So it was left to Heidfeld to take second place, thanks to perfect tyre choices and some sensational driving as the weather worsened, including a three-abreast pass on both Raikkonen and Kovalainen. The remarkable Rubens Barrichello completed the podium, having boldly made an extra stop for extreme-wet tyres during a particularly hard shower. With the rest of the field struggling, the Honda driver rocketed up the order and made it to second, before having to pit again due to a fuel-rig problem. Rosberg and Button made the same tyre gamble and were even quicker, but both spoilt their chances with mistakes. Normally, when a driver's strategy drops him to fourth place in a dry GP with just 17 laps to go, his chances of victory would be over. But that was the situation Hamilton successfully overcame to take an incredible German GP win. The McLaren driver had dominated from pole early on, extending a comfortable lead over Massa and Kovalainen. But when a suspension failure sent Glock's Toyota into the barriers and prompted a mid-race safety car, McLaren decided not to follow the trend and bring Hamilton in for an early second stop, instead believing he could pull out a sufficient lead after the yellow to pit on the originally-scheduled lap. But McLaren hadn't reckoned on the safety car staying out as long as it did and, despite a gallant charge, Hamilton had no chance of retaining the lead when he stopped. He had been helped by the emergence of Piquet in third place, though, for the Renault had made its sole stop moments before Glock's crash, so vaulted from the midfield to victory contention when everyone else pitted under yellow. 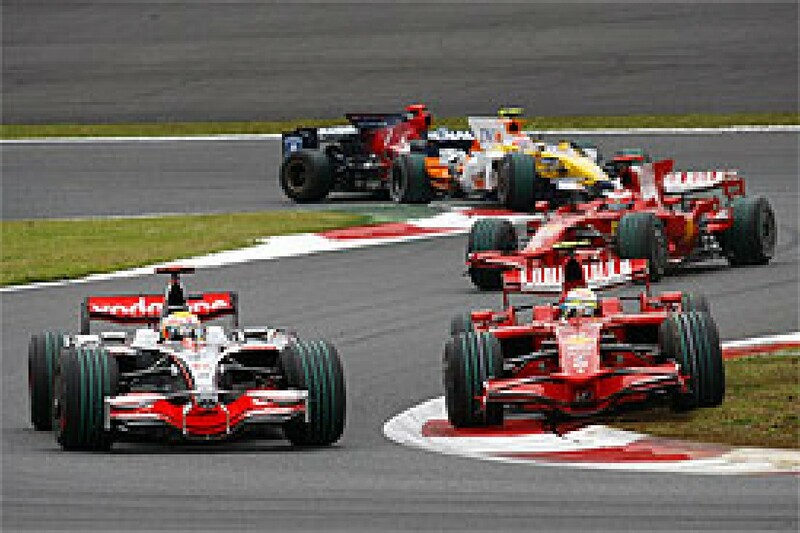 When Hamilton and Heidfeld (who decided to follow the same strategy) pitted, Piquet gained the lead ahead of the quiet Massa and Kovalainen, with the McLaren driver willingly letting Hamilton straight past. The Briton then hunted down the two Brazilians ahead, charging past both Massa and Piquet with identical moves into the hairpin to clinch an unlikely win. Piquet held on to take a shock second ahead of Massa, with Heidfeld slotting in fourth ahead of Kovalainen as the Finn lost time first in the Piquet queue, and then letting Hamilton past. Raikkonen was off the pace all weekend, but came alive in the final few laps, overtaking five cars after the safety car pitstops left him in the midfield to claim sixth, ahead of Kubica. Bad luck had cost Kovalainen several potential podiums earlier in the season, but fortune smiled on him in Hungary, handing him a surprise last-gasp victory on a day when he didn't really have the pace to win. This race should have belonged to Massa, who had brilliantly overturned McLaren's qualifying superiority by blasting ahead of Kovalainen off the line and then driving around the outside of pole-sitter Hamilton at the first corner. He then proceeded to pull away and dominate, until his engine failed just three laps from a deserved win. That should have left the way clear for Hamilton, but he had been badly delayed by a puncture, so it was Kovalainen who found himself elevated to the top step of the podium. Glock took a stunning second place for Toyota, having qualified fifth on a fairly heavy fuel load and then outraced all rivals to clinch the runner-up spot under pressure from Raikkonen, who had again only shown his pace in the closing stages of the GP. Alonso had managed to fend Raikkonen off until the final pitstops, after which he resisted the recovering Hamilton for fourth, while Kubica tumbled from a strong fourth on the grid to eighth as BMW proved horribly off the pace in race trim. The eagerly-awaited new Valencia street track sadly delivered the least eventful GP of the season, despite pre-race hopes that the sinuous, dusty and untried circuit would shake up the pack. Massa took pole and proved untouchable in the race, although he was fortunate to only get a fine rather than a penalty when he was released into the path of Sutil in the pitlane. Struggling with neck spasms and illness, Hamilton settled for second place, with Kubica completing the podium as he returned to the top three for the first time since his Montreal win. Kovalainen never had the speed to fight for a podium and finished fourth, having been under pressure from Raikkonen until the reigning champion was delayed when he pulled away too soon at his last pitstop, leaving a mechanic with slight injuries. He then suffered an engine failure soon afterwards. That handed fifth to Trulli, as the Italian managed to fend off the impressive Vettel, who had been among the frontrunners all weekend. The home crowd had hoped that it might be Alonso doing the giant-killing at Valencia, but instead he lined up only 12th on the grid thanks to a minor error in Q2 and was then taken out by Nakajima on the first lap. The history books will list Massa as the victor at Spa in 2008, but for many this statistic will always be a travesty, for the Brazilian played little part in this epic race and only finished second on the road. Hamilton led away from pole on a slightly damp track, but then had a spin at La Source next time around, allowing Raikkonen - who had made a quick start from fourth, then put a muscular pass on Massa for second - to grab the lead. That was how things stayed for most of the race: Raikkonen leading, and Hamilton chasing, but never quite close enough to mount a real challenge. Then the rain returned with three laps to go, prompting chaos and some incredible racing. Hamilton coped better with the slippery conditions and immediately pounced on Raikkonen at the Bus Stop, then ran out of space and chose to cut the corner rather than slotting in behind. He emerged in front, lifted to let Raikkonen re-pass, and then outbraked the Ferrari again at La Source, this time with more success. But, as the rain increased, things got even crazier. Hamilton slid off at Pouhon, allowing Raikkonen back in front... but only for a single corner before he too spun. The Finn would put his Ferrari into the wall for good when he rotated again further around the lap. That meant Hamilton crossed the line apparently victorious, only for the stewards to rule that he had not sufficiently conceded to Raikkonen after cutting the chicane. He was given a 25-second penalty and fell to third, elevating Massa from a low-key second to an unmerited win. Behind the leaders, several drivers gambled on switching to intermediates - and duly found themselves up to 40 seconds per lap quicker than those struggling on 'dries' as the rain came down! Heidfeld led the gamblers and emerged with a shock second place, while Alonso made a late decision to follow his example and got back up to fourth - where he had run all race, having pushed Massa hard in the opening laps. Sebastien Bourdais had been on course for a breakthrough podium as the madness unfolded, but was too cautious on slicks on the last lap and tumbled to seventh behind Vettel and Kubica. It was another frustrating race for Kovalainen, who made a bad start, received a penalty for punting Webber into a spin, and then had a gearbox failure on the final lap. A weekend of torrential rain at Monza allowed Vettel to spring the biggest shock in years as he became F1's youngest ever pole-sitter and race winner, and took Toro Rosso's first victory, less than three seasons after their transformation from Minardi. There was nothing lucky about Vettel's result - he won the Italian GP because he drove faster than everyone else all weekend. In qualifying, Vettel took a shock pole ahead of Kovalainen and the similarly impressive Webber, with Massa only sixth despite a relatively light fuel load, and Kubica, Raikkonen and Hamilton back in 11th, 12th and 15th, the Briton having taken an unwise gamble on intermediate tyres despite the rain worsening in Q2. 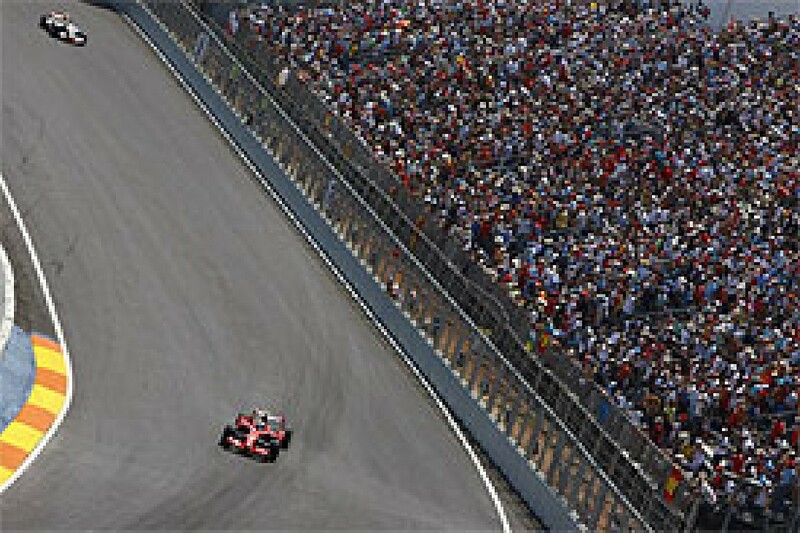 Vettel proceeded to dominate the race from the front, easily pulling away from Kovalainen. As it turned out, Hamilton would be his only threat, producing some excellent early passes and then shrugging off his heavy one-stop fuel load to emerge in second by half-distance. It was touch-and-go whether Vettel could establish enough of a lead before his second stop to beat the McLaren, but ultimately he didn't have to, for the rain had stopped and Hamilton had to make an extra stop for dry tyres, whereas Vettel could make the switch during his second planned pit visit. That left Vettel to win ahead of Kovalainen, with Kubica and Alonso benefiting from bold early switches to 'dries' to take third and fourth. 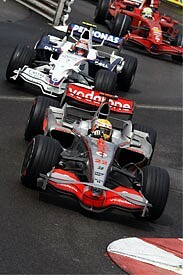 Heidfeld took fifth as Massa had a low-key run to sixth, ahead of the frustrated Hamilton and Webber. Raikkonen was never on the pace and only finished ninth, while the Toyotas would both have been comfortably in the points had they not had to make stops for dry tyres. F1's first foray into night racing proved a huge success, with the spectacle and the excellent new Marina Bay track receiving almost universally positive reviews. It was the perfect setting for one of the modern era's legendary combinations to return to the front, as Alonso and Renault built on their recent resurgence to pull off a stunning win. There was a little good fortune involved, but that only returned what fate had taken away on Saturday, when a fuel-system problem left Alonso 15th on the grid on a day when his excellent practice pace suggested he would challenge for the front row. It was Massa who actually took a crushing pole, and he proceeded to pull away from front-row partner Hamilton in the early laps. Then a safety-car period (caused by a heavy crash for Alonso's teammate Piquet) turned the race inside out. Alonso had started on a bravely light fuel load and made little progress, but the yellow came just after his first stop - meaning he would leap towards the front as most of the rest of the field pitted behind the safety car. Ferrari's evening then turned to disaster when Massa was given the signal to pull away before his stop was completed. He wrenched the fuel hose from the rig, scattering his mechanics, and had to wait at the pit exit until the contraption was finally removed. Further delayed by a penalty and a spin, he would fail to score. Raikkonen - who had been challenging Hamilton for second - lost time waiting behind Massa in the pits and eventually crashed out. After the safety car, Alonso was free to dominate most of the rest of the race, ultimately taking a comfortable victory, to his and Renault's huge satisfaction. Rosberg emerged with a stunning second place, despite being penalised for stopping in a closed pit. The drive-through cost him little ground, for it took eight laps for the punishment to be announced, during which time the Williams (which had led after the safety car thanks to its illegal stop happening while the field was still forming up under yellow) charged away while most of the pack was caught behind Giancarlo Fisichella's one-stopping Force India. Hamilton caught Rosberg by the end, but decided to play it safe and settle for third, ahead of Glock and Vettel. The Red Bull pair and Barrichello followed the same strategy as Alonso, so should have battled for the podium, but all three hit problems: the Honda stopped with an electrical problem soon after its stop; Webber suffered a gearbox failure; and Coulthard fell back to seventh after being prematurely released at his second pitstop. Kubica was in podium contention until he too pitted illegally under the first safety car. His stop was a lap after Rosberg's though, which meant that he was trapped in traffic before his penalty rather than enjoying a clear track, so could not recover. He eventually finished 11th, behind Kovalainen, who had to wait behind Hamilton in the pits and then gambled on a very early final stop in case of more safety cars. With Hamilton on pole and Massa starting only fifth following a poor qualifying run, the McLaren driver should have taken a stranglehold on the championship fight in Japan. 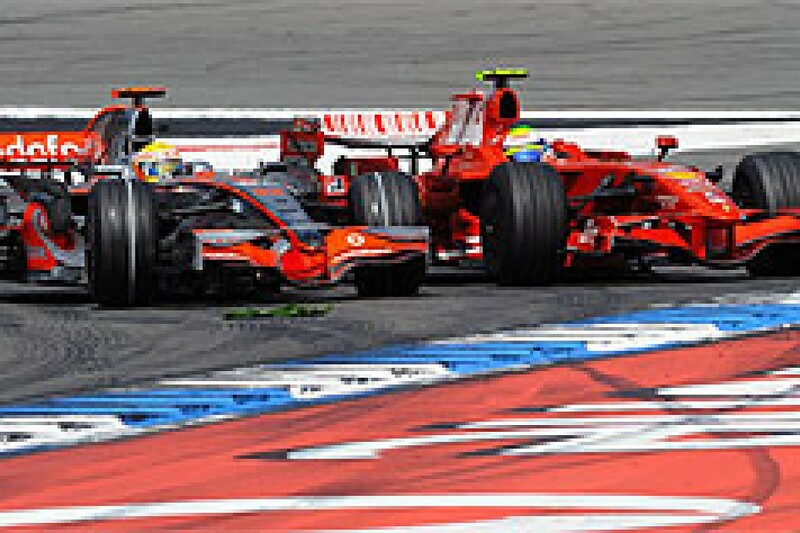 Instead he squandered this golden opportunity with a wild first-corner move on the faster-starting Raikkonen, which took both Ferraris wide and allowed the surprised Kubica and Alonso through into first and second ahead of Kovalainen, who had followed his team-mate off the road. Hamilton then went off again trying to re-pass Alonso a few corners later and found himself back behind Massa, who ran wide into the chicane, allowing the McLaren through, only to then clatter into the back of it at the exit of the corner, spinning the championship leader to the tail of the field. Both Hamilton and Massa would receive penalties for their misdemeanours. But, while the McLaren driver failed to get back into the points, Massa would ultimately salvage seventh thanks to a determined late charge and some brave passes. He also profited when Bourdais was penalised for a tangle in which Massa briefly spun - even though most thought the Brazilian caused the incident himself by turning in on the Toro Rosso as he emerged from the pitlane. The penalty gave Massa an additional point, making the title fight even closer. Away from all the madness, Alonso asked to be short-fuelled at his first stop so he could leapfrog Kubica, and then ran away from the field in the middle of the race to secure his second straight win in fine style. 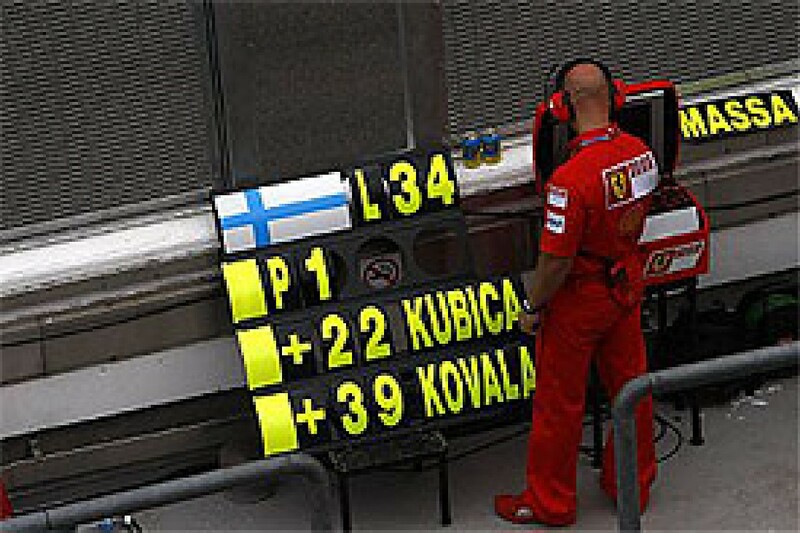 With Kovalainen hit by an early engine failure, Kubica had to resist the recovering Raikkonen for second, which he eventually managed after a determined late battle, while the Ferrari then briefly came under pressure from the impressive Piquet. Under massive pressure to put things right and make up for his Fuji errors, Hamilton delivered a perfect performance in China. He dominated practice, then took a clean sweep of pole position, fastest lap and victory. The McLaren driver looked untouchable as he pulled away from the Ferraris. Raikkonen gave chase in vain, and eventually had to hand second to low-key teammate Massa. Alonso won an early battle with Kovalainen for fourth, while the McLaren driver later suffered a puncture and a hydraulic issue, forcing him to retire. That allowed the BMWs up to fifth and sixth, as Kubica recovered from a poor qualifying performance that had left him 11th on the grid. He closed on teammate Heidfeld near the end, but it wasn't enough to keep his title hopes alive. With Hamilton seven points clear, this should have been a straightforward finale. 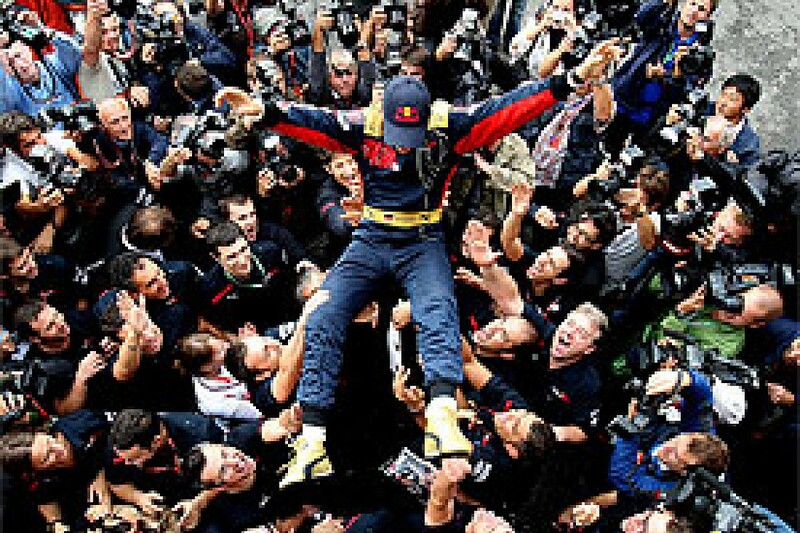 Instead it proved to be the most nerve-jangling decider in F1 history. 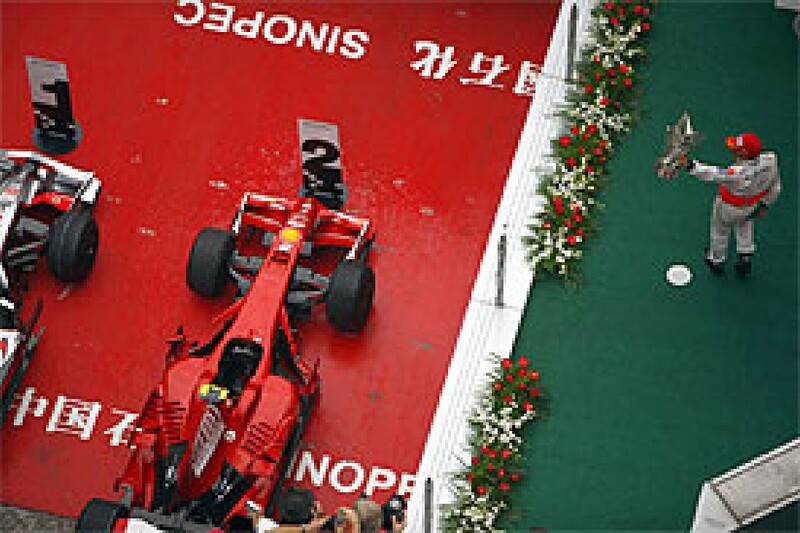 A pre-race shower delayed the start, and everyone began on intermediates, with Massa leading after taking a commanding pole, and qualifying star Trulli running ahead of Raikkonen and Hamilton, who was a conservative fourth on the grid. As the track dried, Hamilton played it too safe and waited too long before changing to 'dries', which temporarily dropped him to seventh, although he soon fought back to fourth place. Meanwhile Vettel and Alonso timed their tyre changes perfectly and briefly challenged Massa, although the Brazilian later pulled away and the Toro Rosso fell back to fifth thanks to its two-stop strategy. Going into the closing stages a Massa win and a Hamilton title looked guaranteed - until the rain returned again. With the forecasts predicting a huge downpour, the title contenders and most of the rest of the field pitted for intermediates. But Toyota chose to stay on dries, allowing Glock to rise to fourth, which pushed Hamilton down a place. He then lost another position when the flying Vettel - who was coping better with the damp track - overtook him while both were wrong-footed as Kubica (finally on the pace in the wet after a poor weekend) unlapped himself. Then the rain intensified, and Glock's gamble - which had previously looked inspired - went against him. Suddenly the Toyota could barely stay on the road and at the very last corner of the season it was passed by Vettel and Hamilton. That gave the McLaren driver the fifth place he needed to scrape to the title, and left the Ferrari crew and the local crowd crestfallen, many of them having begun to celebrate when Massa crossed the line with Hamilton apparently on course for a futile sixth place.